HARBIN- The first China-Russia Exposition, focusing on extending economic and trade cooperation between the two countries, opened on Sunday in Harbin, capital of northeast China’s Heilongjiang Province. During the opening ceremony on Sunday evening, Chinese Vice Premier Wang Yang said, China has organized many famous expositions and trade fairs, but it is the first time for it to co-host a national level exposition with another country. It is a direct reflection of the high level political mutual trust and economic integration between the two countries, he said. During the event, delegates from the two countries will gather discussing bilateral exchanges in such fields as satellite navigation, finance, tourism, agriculture and trade. Russian Deputy Prime Minister Dmitry Rogozin said, the exposition reflects the high level of the comprehensive strategic partnership between the two countries and demonstrates the two countries’ common aspiration in carrying out long-term mutually-beneficial cooperation in different areas. The exposition covers an area of about 86,000 square meters, and a total of 1,597 enterprises from different countries will join the event. The expo, scheduled to last from Monday to Friday, is jointly held by China’s Ministry of Commerce, Heilongjiang provincial government and the Russian ministries of economic development and industry and trade. 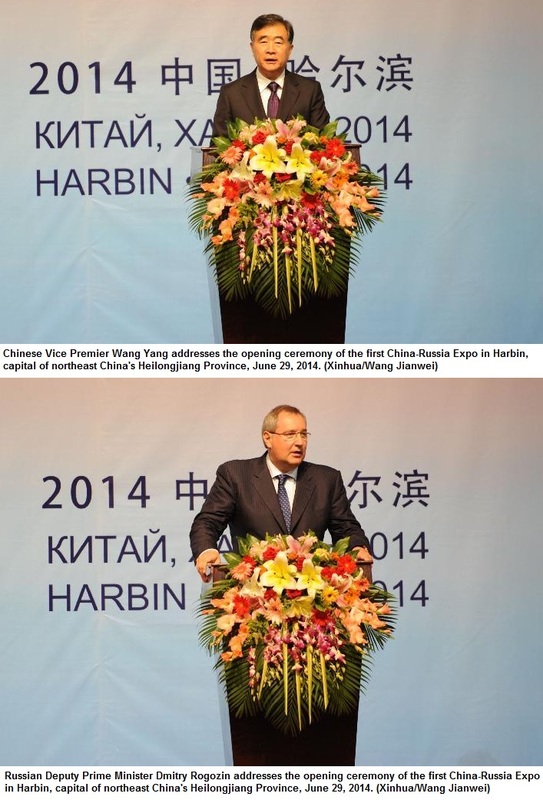 The event’s predecessor was the China Harbin International Economic and Trade Fair initiated in 1990. It was upgraded to an exposition earlier this year to focus on bilateral cooperation. Russia is a major trade partner of China. In the first four months of 2014, bilateral trade volume grew by 3.4 percent year on year to 29.06 billion U. S. dollars, official statistics showed. Approved by the governments of China and Russia, China-Russia Expo (abbreviated as the Expo) will be held in Harbin of China from June 30th to July 4th, 2014. The Expo is cosponsored by the Ministry of Commerce of the P.R.China, the People’s Government of Heilongjiang Province, the Ministry of Economic Development of the Russian Federation, the Ministry of Industry and Trade of the Russian Federation. With a theme of “new opportunities, new platform” , the Expo is upgraded from China Harbin International Economic and Trade Fair which has been held for consecutive 24 years, which is an important cooperation project on exhibition industry between China and Russia. The Expo is an innovative, open and international large-scale exhibition, which is also an international exhibition platform built by China and Russia. The two sides will give a full play to their respective advantages to invite more businessmen to participate in and visit the Expo. The Expo will highlight the professionalization of exhibition, focus on effective matchmaking of mega enterprises and big projects, provide more opportunities of communication and cooperation, promote multilateral and multi-fields deep cooperation. Video: Inside Story – Russia and China: A NATO of the East?